This past weekend marked the 47th anniversary of Dr. Martin Luther King, Jr.'s "I Have a Dream Speech" but the nation's attention was drawn to two very different rallies with two very different objectives. The "Restoring Honor" rally, led by conservative talk show host, Glenn Beck, took place on the National Mall while the "Reclaim the Dream" rally, held at a high school and moved to the future site of the MLK memorial, was initiated by Rev. Al Sharpton. Without going into the details of what was covered at each of the rallies, I do think that their existence should give us pause as we consider the implications for our nation. While Beck's rally was primarily attended by white people, Sharpton's gathering was mostly made up of blacks. Both rallies had a high proportion of individuals that would identify themselves as Christians in attendance. How is it that people who claim to know and serve the same God can view the world so differently? If we do, in fact, read from the same Bible, how can we have such radically different perspectives on the role of government in our lives, how to treat the rich and poor and the place of God in the public square? There is no doubt that there is a growing division among Christians that is reflected in our political preferences. If we were to place the average politically conservative, white Christian in a room with the average politically liberal, black Christian, there would likely be few things that they would agree on if the conversation turned towards politics. As one that lives in both these worlds, I am honestly concerned for the witness of the Christian church in America. But I am not necessarily concerned that we do not see eye-to-eye politically. Jesus never said we had to agree on health care reform or on government spending. What I am concerned about is the animosity that exists among members of God's family and the venom that can be displayed toward one another over matters that, at times, aren't even mentioned in the Scriptures. 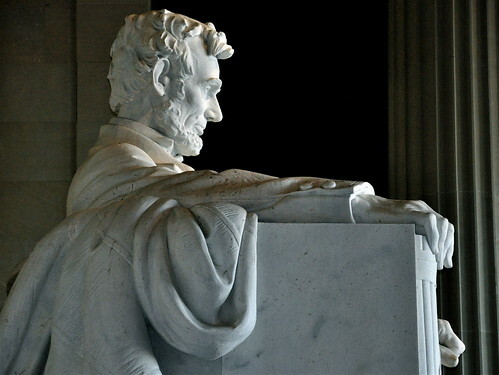 In a famous 1858 speech, soon-to-be president Abraham Lincoln was quoted as saying that "a house divided against itself cannot stand." Even though President Lincoln was referencing the divide that had been caused by slavery, it can certainly be applied to our modern times. But more than that, it wasn't Lincoln who came up with this phrase. It was Jesus himself who said these words in Matthew 12:25 in response to the religious leaders of his day who insisted that his works were from Satan. "My prayer is not for them alone. I pray also for those who will believe in me through their message, that all of them may be one, Father, just as you are in me and I am in you. May they also be in us so that the world may believe that you have sent me. I have given them the glory that you gave me, that they may be one as we are one: I in them and you in me. May they be brought to complete unity to let the world know that you sent me and have loved them even as you have loved me. "Father, I want those you have given me to be with me where I am, and to see my glory, the glory you have given me because you loved me before the creation of the world. "Righteous Father, though the world does not know you, I know you, and they know that you have sent me. I have made you known to them, and will continue to make you known in order that the love you have for me may be in them and that I myself may be in them." "Men often hate each other because they fear each other; they fear each other because they don't know each other; they don't know each other because they cannot communicate; they cannot communicate because they are separated." Instead of listening to the media tell you how to feel about those that don't think like you, intentionally spend some time with those that hold different political beliefs or have a different cultural background. Visit a different church and invite somebody new over for dinner. Spending time with someone's family over a meal (and they with yours) will go a long way. 2. Seek to understand where they're coming from. So much of our political discussions these days are one-way shouting matches. After learning that someone views politics differently than you, simply ask them, "That's an interesting perspective. Why do you feel that way? How did you come to hold that view?" If you're a member of the Tea Party, it should concern you that some African Americans view that party as racist. If you're a supporter of President Obama, it's important to understand that most disagreement with his policies is not because of his race. In hearing another person's perspective, don't try to argue their points or try to prove where they're wrong. You'll be amazed at how they might ask your opinion if you listen to them first. 3. Look to find common ground. Refuse to apply labels to one another. It is all-too-easy to assume we know everything about someone because of their ethnicity or political affiliation. Don't put people in a box just because you disagree with them over a single issue. There are few things that are disappointing as being judged as something that you're not. Look for that which you can agree on and build trust with one another. Try to find good points that person makes and agree with them where you can. 4. After building trust, respectfully disagree. Even if you're able to form a friendship with someone, the issues that you disagree about aren't likely to go away. To be friends with someone doesn't mean that you have to compromise your core convictions. But if you've gotten to know them, you've listened well and you've sought to find common ground, the likelihood of having a healthy, productive conversation in which you disagree with one another without being disagreeable increases exponentially. Political disagreements these days can so quickly devolve into arguments about petty, non-essential things. Don't be like that. For those of us that are followers of Christ, we simply cannot allow our culture or our political affiliations to supersede our commitment to Jesus and his people. We can be passionate about our views but we don't have to express them in a way that brings shame to Christ and distorts his purposes. God's agenda is much bigger than any party platform and his plan is broader than what happens in our little country. Yes, we can be bold in our convictions yet Christ-like in our humility. And maybe, just maybe, if we begin to treat our brothers and sisters in Christ with more civility then maybe others might be attracted to the God we proclaim. Excellent post, Scott. I appreciate your perspective and especially the practical suggestions. Thanks. What is True of This Year's College Freshmen? How Are Michigan's Winged Helmets Made? Have You Heard About Global Short Film Network?